Princess Elizabeth celebrated her 21st birthday in the midst of her 1947 tour of Africa with her parents and sister. It was a prosperous birthday for her jewel collection, with presents including the Flame Lily Brooch from Rhodesia and her "best diamonds" from South Africa (and a prosperous year for the collection overall, as she would add her many wedding presents to the vault later on!). 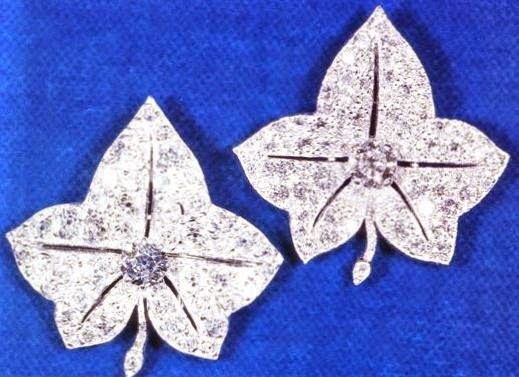 Her parents, King George VI and Queen Elizabeth, contributed to the birthday jewel haul with this set of diamond clips in the form of leaves of ivy. Each leaf includes a central brilliant diamond and pavé-set leaves in platinum. Like several of the gifts she received from her parents in her early years, these brooches came from Queen Elizabeth's existing jewel collection. The Queen's Diamonds by Hugh Roberts revealed that they were part of the large Greville bequest, the collection of jewels belonging to the Hon. Mrs. Ronald Greville which were bequeathed to the future Queen Mother in 1942. The ivy leaf brooches were made by Cartier, the first before 1930 and the second in 1937. The Queen could occasionally be seen in those early years having a bit of fun with these brooches, perching one on her hat (as seen above, with President Truman) or placing them on opposite sides of her neckline. Today, you'd be most likely to see them both on one side in traditional brooch position, though sadly they have become a rather rare sight. They are quite elegant little jewels, and I would love to see them enter the regular brooch rotation again!